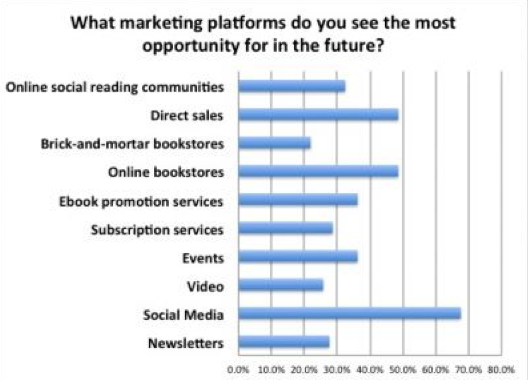 Does Social Media Marketing Actually Sell Books? What if all the hype about marketing books via social media is just noise? Social media may be here to stay, but are publishers seeing the ROI that they expected? At the end of 2014, Book Business Magazine surveyed the industry and asked the question, “What marketing platforms do you see the most opportunity for in the future?” The top answer was social media, which received 68% of the responses. If the publishing industry believes social media represents the best hope to market books, there seems to be a disconnect. For instance, none of the major publishers listed above have attracted more than 1,000,000 followers. Their numbers seem even lower when compared to the top retailers, such as Amazon, B&N, and Walmart. If publishers want to reach their entire Facebook audience, they must “pay to play.” Recent studies calculate that a free post only reaches 8 -- 16% of the intended audience. If you want a post to reach everyone, Facebook forces users to pay money to “sponsor” a post that everyone will see. Fees to sponsor a post can add up quickly and minimize the ROI of a marketing budget. Even if a publisher attracts millions of social media followers, don’t expect great results. A boutique publisher with over 2.5 million Facebook fans told me they rarely see more than a 5% response rate to their average posts. And, when posts focus on pushing sales of a specific book, the response rate is even lower. After all the work to amass an audience, social media marketing has yet to satisfy their goals. Research by the Ehrenberg-Bass Institute in the book, “How Brands Grow,” revealed that social media tends to skew towards heavy users of a product. That may sound like good news. Every publisher would like to attract more heavy users. But, here’s the problem. The Ehrenberg-Bass Institute also found that brands grow primarily by attracting more light buyers, rather than heavy buyers. In other words, social media can work against long-term growth, because it’s not the best platform to attract a wider base of light buyers. In some ways, sending regular posts to a social media audience can resemble a minister who preaches to the choir. People may like the preaching, but the congregation isn’t growing. Long-term growth is achieved by continually expanding to wider audiences, which research shows isn’t social media’s strength. In 2014, McKinsey Consulting released a surprising study that found email is 40 times better than all social media combined at acquiring customers. 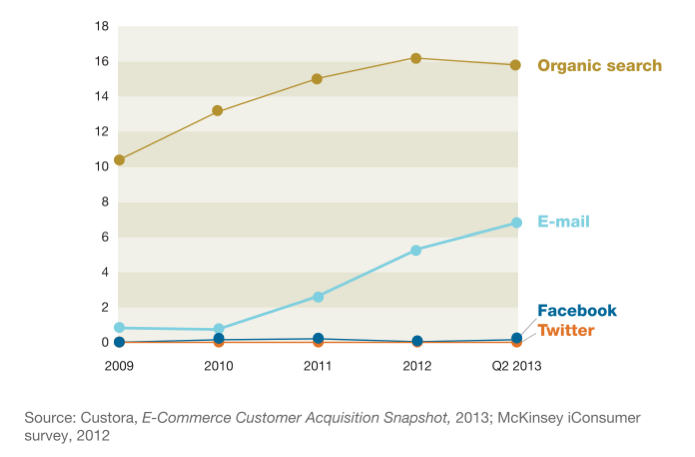 While social media may be good at driving awareness, email is superior at driving sales. Thus, consider shifting your focus to building bigger email lists and sending effective email campaigns on a frequent basis. Offering quality content for free is essential to attracting email subscribers and boosting email open rates. This dynamic plays right into the hands of book publishers. Publishers are loaded with great content. Don’t hoard it or hide it. Offer free book content as an inexpensive way to entice email subscribers and drive book sales. Analyze your total audience metrics and urge your marketing department to constantly seek new and wider advertising opportunities. Getting authors interviewed on national TV and radio certainly helps. But, there are plenty of inexpensive options to expand promotional reach, such advertising on popular websites, online magazines, and sponsored content on high traffic blogs and email newsletters. In addition, Facebook offers “Lookalike Audiences,” which can help publishers advertise to new people who are similar to their current audience. Upload a list of current email subscribers or Facebook users. Then, Facebook will cross-reference those emails with its database and create a custom audience of new people that you can then target with advertising. Many publishing houses have personnel dedicated to social media marketing. In some situations, it may be wise to examine the actual ROI of their efforts. If your company has thousands of Facebook followers but cannot ascribe sales growth to that audience, consider shifting priorities to other activities. Do not waste precious in-house marketing resources on unsatisfying results. If social media works for your publishing house, that’s great. If not, switch some of your focus to improve inbound content marketing, boost organic search, add email subscribers, identify new advertising channels, etc. E Rob Eagar Author's page Rob Eagar is a book publishing consultant, helping clients create three different types of New York Times bestsellers, including frontlist non-fiction, frontlist fiction, and backlist non-fiction. He is the founder of Wildfire Marketing, a consulting firm that has worked with numerous publishers and coached over 400 authors.